Oh my goodness, I love Bill Bryson's books. The only one I haven't finished yet is a Short History of Nearly Everything, and I'm working on that one right now. So much is going over my head, and it's hard to stay enthralled, but I feel like it could be summarized by saying "Everything is either way smaller or larger than you could ever believe." He must spend so much time researching and writing each book, but I am ready for a new release soon! I liked this book too, although there were some parts where I was like "YOU ARE JUST SHOVING IN RANDOM INFO THAT YOU FIND INTERESTING." Apparently I yell at my books a lot. A.) I completely agree with you about non-fiction. It is either enthralling or dead boring to me. B.) I love Bill Bryson's books. C.) I'm adding it to my goodreads queue. Thanks for the book tip. I want to read this one. Hi there! 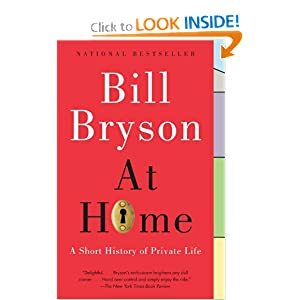 It's so funny that you are talking about this book because I just read a VERY similar one called Home: A Short History of an Idea (by Witold Rybczynski). Have you heard of it? It talks about the word comfort and the origin of home as we know it today, and lots of history of houses. I, too, was spewing out facts to all that would listen and didn't understand why they weren't equally fascinated, haha. I'll have to look at this one too! I am looking for a new read!!! Thanks for sharing!!!! I definitely go through phases where I'm only interested in non-fiction, and then other times it's the last thing on my mind. Bryson is really interesting, too-- I've read a couple things by him on language and the like, and At Home is totally on my list.